This dip is a hit! You want to be with your friends enjoying the game, or commercials right? You don’t want to be stuck in the kitchen cooking. This is one of those dips you can put together the night before and just bake. I put all the ingredients in a small cast iron skillet and bake it while I am preparing other stuff. I honestly think this is one of my game-day favorites. I love Nachos, but hate when they get soggy. That’s why this dip is so perfect. If you have any leftovers, which I rarely do, you can wrap it in a tortilla and make a yummy burrito. Spread cream cheese into a baking dish. Next, spread chili over cream cheese. Top with Velveeta cheese. Bake at 350 degrees until cheese melts 15-20 minutes. OM Really I think look georgeous and Im sure that is, what nice dip veronica! Great idea! I bet this is delicious. I also hate how the chips always seem to get overly soggy, especially the ones in the middle/bottom. Sounds fantastic, must try! My mom used to make this all the time when I was a kid. It was literally one of my favorite things ever. I don’t eat it anymore now that I’ve gone vegetarian, but I still love it! Oh my word!! I am SO making this for super bowl!!! Bookmarked for Super Bowl! Thanks! I think I need to make this for the super bowl. This looks so delish. Oh my. I’m a sucker for a good nacho dip. I wouldn’t even share. 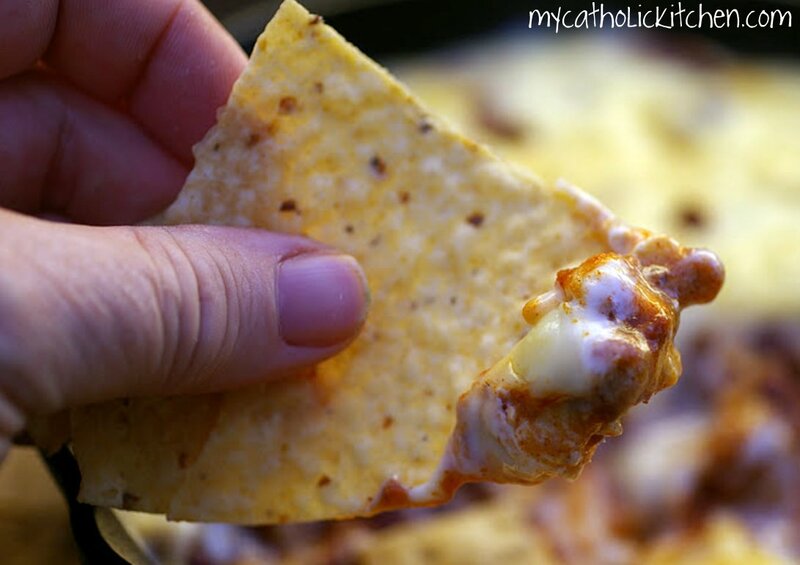 Soggy nachos are the WORST but this dip is definitely a game changer! Yum! I like easy, tasty appetizers like this…and LOVE that it’s in a cast iron pan! 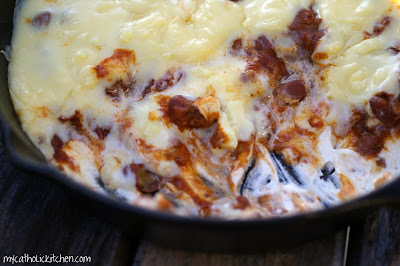 This is one of my friends favorite dips!! I love the addition of the extra cheesy top! I think you have just put nachos and dip on the menu for this weekend, Veronica. I love how easy it is to put together such a tasty dip. Have a great weekend.